The Android app is now available! The Station of the Cross network provides several options for listening to its programming. In addition to the traditional over-the-air signal, which is found locally at WQOM 1060AM, they also provide a live stream at their website WQOM.org. Those wishing to listen to The Good Catholic Life programs after they’ve aired can listen right from our website or download a file to their computer on the page for each day’s program. If you have an iPod, iPhone, or iPad, you can subscribe to a podcast of the show in iTunes so that you can take the show with you as you go. 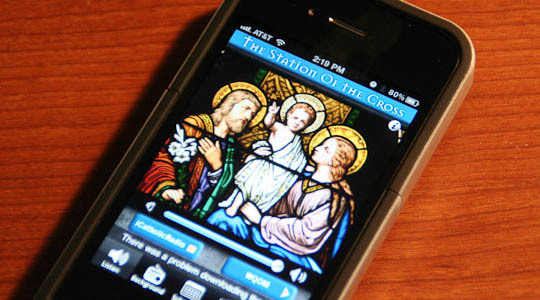 And now, if you want to listen to The Good Catholic Life and the rest of the WQOM programming LIVE on your Internet-connected portable media device, you can now download an app to your iPhone or iPad or an app for your Android device! With the app, you have the option to listen live to the Station of the Cross network stream or to the local programming of WQOM, including The Good Catholic Life. Thank you for listening and please enjoy Boston’s Catholic radio on WQOM and The Good Catholic Life.